This is what it’s like for an undocumented parent raising children in the U.S.
Five members of the Valenzuela family live in a two-bedroom apartment in Montebello. Luz, the head of the household, and her elderly mother, Maria, are undocumented. Two of Luz’s children, Carmelita and Victoria, were born here and are U.S. citizens. Another child, Esteban, is a beneficiary of Deferred Action for Childhood Arrivals, a program that delays deportation for at least two years for undocumented immigrants who entered the U.S. before age 16. Here’s how they get by. Studied engineering in Mexico before entering the U.S. on a tourist visa. Runs a small business with her mother selling supplies for Latino cultural celebrations. 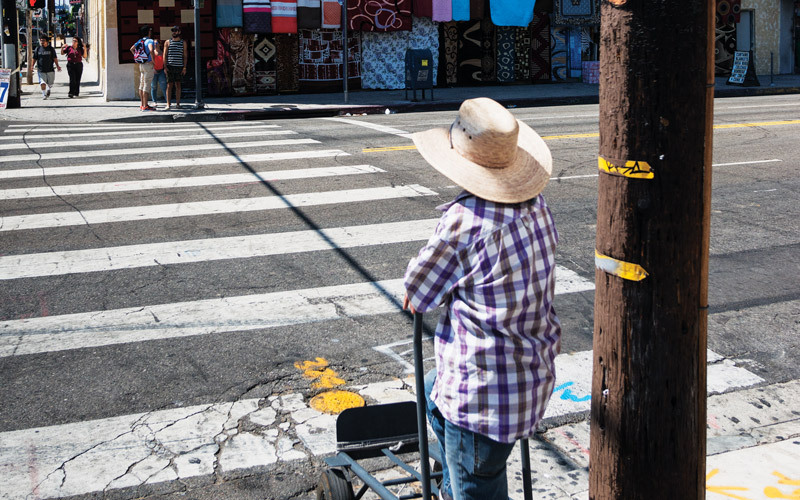 Immigrated in 1994 and worked at a booth at a swap meet; a year later she rented a storefront in East Los Angeles, where she and Luz still work. Studies psychology at Cal State L.A. He and his brother, Francisco, entered the United States with their mom. Francisco lives in Arizona. Studies political science at Cal State L.A. She shares one bedroom with her sister and her grandmother. Esteban has the other. Luz sleeps in the living room. Is a sophomore in high school. To buy clothes, she receives $100 a month from her father—his only contribution to the family budget. Esteban earns minimum wage ($10.15 an hour) at a laser printing company. He plays keyboards in a band that sometimes has paid gigs. Carmelita works as a teacher’s assistant at Jumpstart, the national early education organization that recruits and trains college students to serve preschool children in low-income neighborhoods. She earns $1,000 a semester. Luz and Maria’s business usually brings in $1,400 a month, which also covers the use of Luz’s 1999 Dodge Caravan. For extra cash Luz sometimes charges $100 to plan parties. Their undocumented status makes it difficult to find other, more secure jobs; when business is slow, money is even tighter. Four years ago, when the family moved from East L.A. to Montebello to escape gang violence, their rent went up $200, to $1,150. Luz says it’s worth it to keep her family safe. Each month Luz pays $950 in cash, and Esteban contributes $200. Carmelita and Esteban are the only ones in the family who have checking accounts that they can access with debit cards. (Luz has a prepaid debit card for emergencies but pays for almost everything in cash.) Carmelita uses her bank’s autopay service to cover the family’s Internet, cable, gas, and electricity costs. That averages $200 each month, which she pays out of her wages. Esteban is the only family member with a credit card, which he got two years ago. When running low on funds, he uses it for small purchases, but he is trying to build his credit score, so he tries to always pay his bill on time. The family receives medical care through My Health LA, which provides primary health care at no cost to eligible residents of Los Angeles County—whether they’re uninsured or uninsurable. Services are provided by 193 nonprofit Community Partners clinics. Carmelita filled out the Free Application for Federal Student Aid (FAFSA), which resulted in her Cal State tuition being covered. Esteban has benefited from the California Dream Act, which allows undocumented and nonresident documented students who meet certain criteria to apply for and receive private scholarships funded through public universities, state-administered financial aid, university grants, Cal Grants, and—in Esteban’s case—community college fee waivers. Books and other expenses come out of his wages. Next articleWhat Defines a Successful Immigrant?